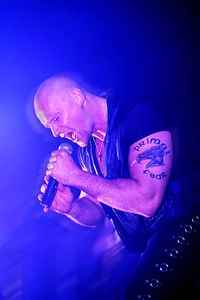 Ralf Scheepers (born 5 February 1965 in Esslingen, Germany) is the current vocalist for German power metal outfit Primal Fear. He has a relatively high-pitched tenor-esque singing voice and sometimes uses a shriek reminiscent of Judas Priest's Rob Halford, although it is his baritone lows which give him a near 4 octave range in the modal register. He has also sung in Gamma Ray, Tyran' Pace, and has been rumoured to have done live work on a session base for Helloween on their 1986 tour, which has been denied by Michael Weikath in several interviews. Ralf Scheepers has also done guest vocals for the bands Scanner, Therion, Ayreon and Shadow Gallery.